I was so impressed with the results of our home-smoked bacon I thought I’d try my hand at the Italian version of cured pork belly–pancetta. The process starts out much the same, with a five-pound slab of cross-cut belly acquired at the Dupont Circle farmers market from Bev Eggleston’s EcoFriendly foods. Bev, who raises his own pigs and loves to show off how fat they are, gives me a hard time for shying away from his incredibly fatty pork belly. “You’re afraid of it, aren’t you?” he teases. Being a beginner at pancetta making, I was looking for a more traditional piece of pork to start with. I placed my order over the phone and on the following Sunday Bev brought a couple of pieces of cross-cut belly for me to choose from. The slab is first rubbed with a dry curing mix: 4 minced cloves of garlic, 2 teaspoons (12 grams) pink salt, 2 ounces (50 grams) kosher salt, 2 tablespoons (26 grams) dark brown sugar, 4 tablespoons (40 grams) coarsely ground black pepper, 2 tablespoons (10 grams) crushed juniper berries, 4 crumbled bay leaves, 1 teaspoon (4 grams) grated nutemed and the leaves from 4 or 5 sprigs fresh thyme. If necessary, trim the belly so that the edges are all neat and square and make sure the skin is removed. 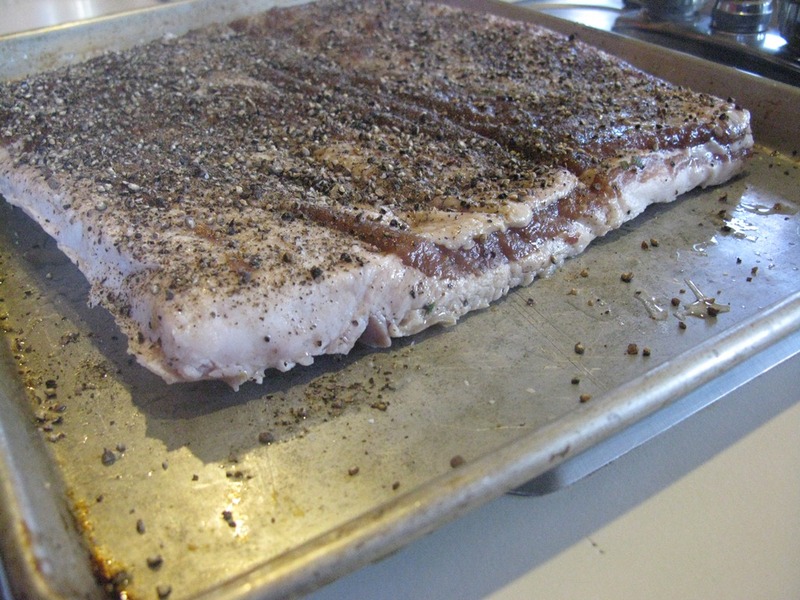 Rub the belly all over with the cure mix, reserving half of the black pepper for later. Place the belly in a large Ziploc bag or in a covered, non-reactive container just large enough to hold it. Refrigerate for seven days, turning the belly occasionally and rubbing it to redistribute the seasonings. Check the belly for firmness after seven days. If it feels firm at the thickest point, it’s done. Otherwise, let it continue to cure for another day or two. When the meat is cured, remove it from its container and rinse under cold water to remove the seasonings. Don’t worry if some sticks to the meat. Rub the reamaining pepper over the meat side. Now, for the most challenging part. The belly with all its fat will be slippery. But you need to roll it into a log as tightly as possibly, so that there a no air pockets inside where pathogens might breed. 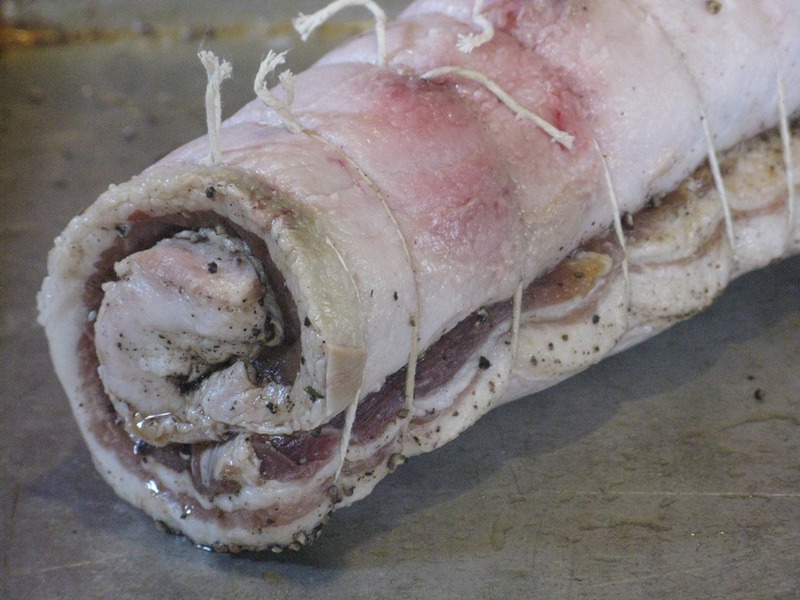 Finally, you’ll need to find a cool, humid place to hang your pancetta to dry for two weeks. 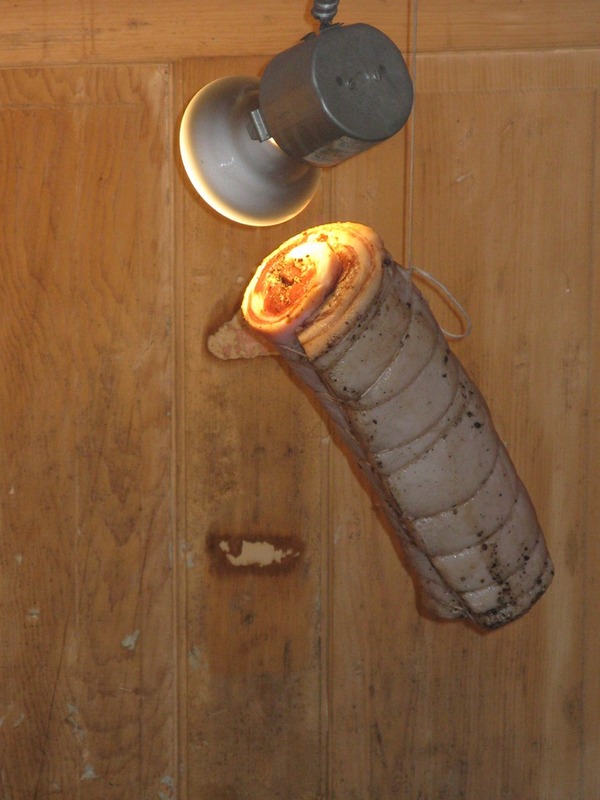 The best I could do was the bottom of the back stairway leading to our garage, where an open light fixture offered a hook from which to suspend our meat at the end of a string as you see here. I placed an aluminum pan under the meat to catch any drippings. Every day I turn on the light and take a look to see how the meat is doing. So far, so good. Already it’s starting to dry and looking more like an authentic pancetta. I’ll report back when it’s finally done and we get to taste it. I’m loving these adventures with things like bacon — and particularly pancetta ! We used to eat this a lot in Europe, but it’s too costly to be a staple here. Look forward to seeing how it turns out. Two weeks.. not shabby.